“Organic” and “all-natural” are two words that we’re seeing everywhere these days, but what exactly is “organic?” Merriam-Webster dictionary defines organic as something that is “grown or made without the use of artificial chemicals.” Today, it seems like chemicals are in everything from the food that we eat to the items we use to take care of our homes. More and more, people are looking for ways to greatly reduce the chemicals to which their families are exposed. Organic food is more popular than ever, with most grocery stores offering organic options in their produce and meat, as well as prepared food items. But what about products used to clean your home? If you are looking for an organic cleaning solution, soap nuts (also called soap berries) are a fantastic, multi-purpose answer. The hard-shelled little nuts (which are actually classified as fruit) contain a natural ingredient called saponin. Gentle and low-sudsing, saponin has been used for thousands of years as an all-natural soap. But It Doesn’t Make Lots of Bubbles! Some people are thrown off by the fact that soap nuts don’t make a lot of suds, as they equate suds with cleansing power from years of using toxic cleaners. More bubbles do not mean more cleaning power, though. What people don’t realize is that the manufacturers of many cleaners add in chemical sudsing agents in order to create suds to make people feel that the cleaner is doing a better job. What makes cleaners work isn’t the suds; it’s something called a surfactant that helps loosen and remove dirt. Chemically-derived surfactants can irritate people’s skin, as well as pollute the environment. The saponin in soap nuts is an all-natural surfactant and works wonders on a wide variety of dirt and grime. Soap nuts make a wonderful, chemical-free laundry detergent. Although they do have a light fragrance (some people say they smell slightly like vinegar), they don’t leave any fragrance on your clothes, so they’re wonderful for people who are sensitive to fragrances in other cleaners. They’re safe to use for people with psoriasis and eczema, as well as for people who have sensitive skin. 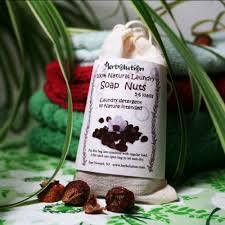 For new parents looking for a gentle way to wash their baby clothes or cloth diapers, soap nuts are a perfect option. Each batch of soap nuts can be used for several washes. They only need to be replaced once they start losing their sudsing power, don’t smell anymore or begin to look dried out. Most users report being able to use the same organic soap nuts for 5 to 7 laundry loads. Soap nuts are good for much more than laundry detergent. They can also be boiled and used to make soap nuts liquid. In liquid form, soap nuts can be used to clean pretty much anything from people to countertops and even windows! If you like a bit of all-natural scent to your soap, add in a few drops of your favorite essential oil in order to freshen things up a bit more. Whatever your organic cleaning needs, soap nuts can help!